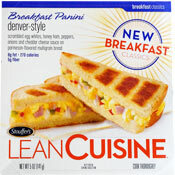 I tried both varieties of this product: the Denver-Style Breakfast Panini and the Sausage, Egg & Cheese Breakfast Panini. They each take about two minutes to prepare. Each one has some high points and some low points. Let's break(fast) it down. The first thing you should know about this panini is that it has a distinct sweetness. This may catch some consumers off-guard since the packaging doesn't place a lot of emphasis on that aspect. 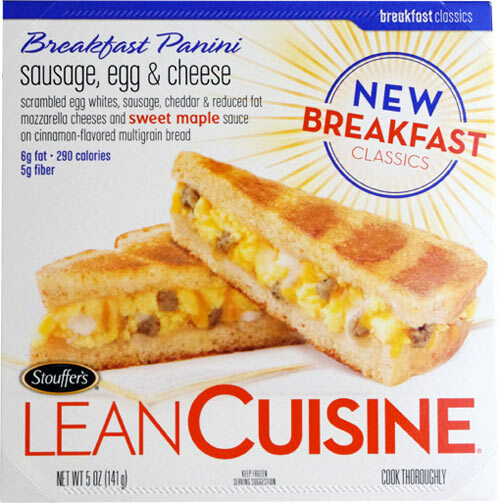 Here's how the product is described on the box: "scrambled egg whites, sausage, cheddar and reduced fat mozzarella and sweet maple sauce on a cinnamon-flavored multi-grain bread." My first impression was that this product was easy to make and smelled great during microwaving - an enticing maple aroma filled my kitchen. While the cooked product didn't look nearly as appetizing as the picture on the box, it looked better than certain other microwave breakfast products I've reviewed. As for taste, I enjoyed the sweetness of the panini. The maple and cinnamon flavors were noticeable but not overwhelming. People who like McDonald's McGriddle sandwiches will appreciate these flavors even though they're more subdued compared to the McGriddle. The sausage tasted like good quality sausage. Unfortunately, there wasn't wasn't as much of it as I would have liked. The egg seemed to add more texture than flavor. The cheese was barely noticeable. Overall: This is a good product that could have been much better with a little more sausage and a little more cheese. Here's how the box describes this product: "scrambled egg whites, honey ham, peppers and cheddar cheese sauce on parmesan-flavored multi-grain bread." My favorite part of this panini was the parmesan-flavored bread. If I could buy Lean Cuisine parmesan-flavored bread to make my own homemade paninis, I'd run to the store right now. I also appreciated the vegetables - onions and to a lesser degree peppers. 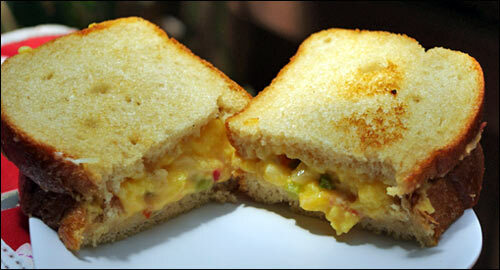 Like the other sandwich, the scrambled egg whites lent a decent texture but very little flavor. As for cheese, some bites tasted indulgently cheesy, while other bites lacked cheese flavor. You may have noticed that I didn't mention the ham. What's to mention? Where was the ham? My sandwich had about 10 tiny pieces of ham and they made no impact at all on the flavor. I wonder if I didn't get a dud and other boxes of this product might contain more ham. Overall: This panini tasted really good, but it would have tasted even better with more ham, a more even cheese distribution and a more authentic egg flavor. As far as nutrition goes... each panini has less than 300 calories. The Denver-style panini has 8 grams of fat (2.5 grams saturated and 0 grams trans) while the other has 6 grams of fat (3 grams saturated and 0 grams trans). Both sandwiches provide 5 grams of dietary fiber. The Denver sandwich has significantly less sugar (6 grams versus 14 grams). That's really pretty good when you consider that a Sausage, Egg & Cheese McGriddle Sandwich from McDonald's has 560 calories, 32 grams total fat, 12 grams of saturated fat (seriously) and only 2 grams of dietary fiber. I'm recommending these based mostly on nutritional comparisons with fast food sandwiches. 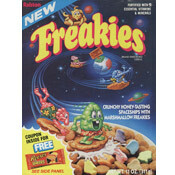 If you have a breakfast sandwich craving and you're short on time, these are a good substitute for the drive-in window. 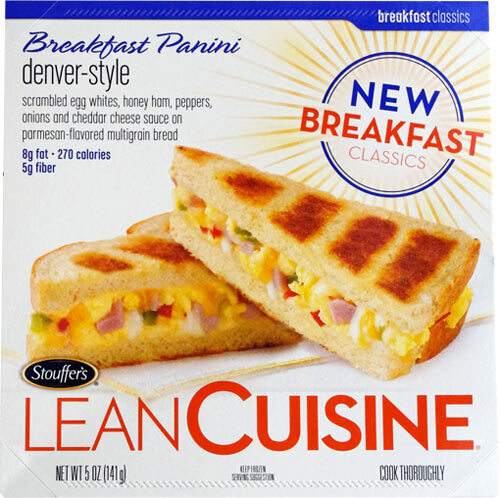 What do you think of Lean Cuisine Breakfast Paninis?